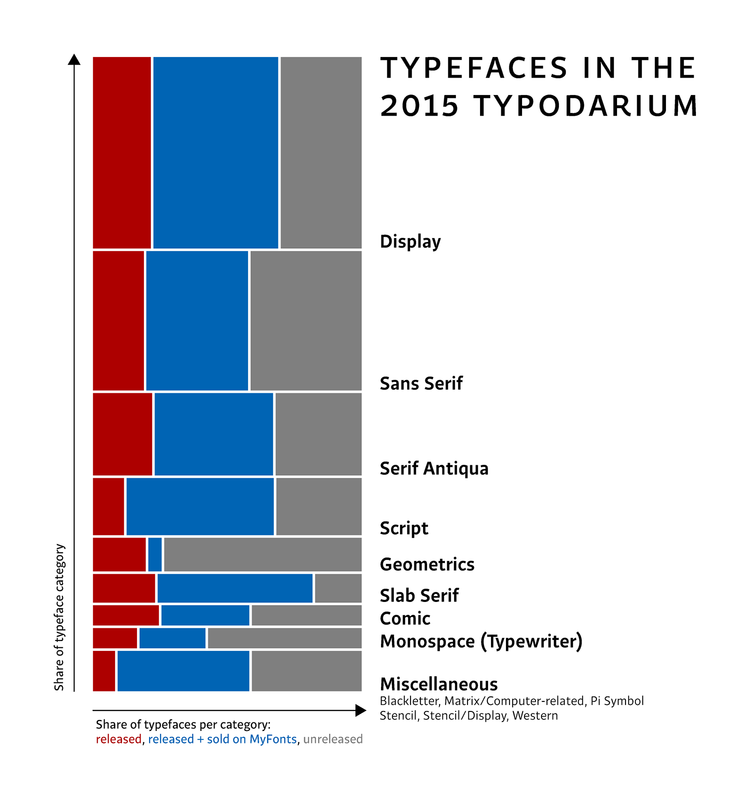 Under the type volcano: A review of the 2015 Typodarium | Isoglosse. On the one hand, I expect to find new typefaces in such a calendar (i.e. typefaces I am likely not to have seen or not to have noticed before). I am sure many others share this expectation. And even if this specific calendar does not claim to only feature recent work, it is quite clear from the design dates of the majority of the typefaces that new designs are in fact preferred over older ones. Almost 80 % of the featured typefaces were designed in 2013 or 2014 (this, like other statistics given below, is based on data from the calendar itself). That’s fine. It’s less great that about 7 % of the typefaces were designed before 2010. The calendar even features two typefaces from 1996. In my view, the calendar would have been more useful and interesting without these 7 %. I already knew many of the older typefaces and, regardless of that, they didn’t seem particularly interesting to me. We’ll get back to this point later. On the other hand, I expect to find typefaces I can use (i.e. typefaces that I can get from the designers, their foundry or some reseller). There is no information in the calendar itself on the release status of the typefaces featured (which makes sense, as this could change any day), so I collected some data on this myself – simply by checking if a Google search turned up a website where you could get the typefaces. I’ve done these searches over a few days just before Christmas, so I may have missed some releases over the holidays. In my analysis, ‘Released’ doesn’t mean ‘It’s a half-finished graduation project, but you could send the designer an e-mail and ask politely if you may use it’, but ‘There is a place where anyone can download this font for free or for money’. For well over a third of the typefaces, there was no such place (37.5 %, to be exact). And that’s too much in my book. Typefaces that happen to be unreleased are not less interesting than released work. But as a daily reviewer, I have experienced that information on the web about unreleased typefaces is often sparse. To be inspired by a typeface, many will need more than a small black-and-white calendar sheet. If a typeface has not been released, you are far less likely to find extensive samples (or any samples at all). In other words: There is nothing wrong with including unreleased work, but it should be less than one typeface in three. Oh, and talking of typeface releases: Of the 228 typefaces that you could get your hands on if you want, more than two thirds are available on MyFonts. This percentage may be a bit higher than in the type industry as a whole. Calendars like Typodarium are probably attractive to small (or insignificant) foundries that are trying to get some exposure. Such foundries often do not have sophisticated websites where you can test and buy their typefaces, but rely on resellers such as MyFonts (again hoping to get some exposure). There are some more problems with last year’s Typodarium that editors and jury members could not fix as easily. One of them concerns the share of typeface styles or categories. Have a look at the diagram below. On the y-axis, you see the share of each style or category – Display, Script, Monospace etc. – in the calendar. On the x-axis, you see the proportion of released (red: released, blue: released and sold on MyFonts) and unreleased typefaces (grey) for each style. The classification is based on the information given on the individual calendar sheets, which seemed largely correct to me. The category names are not mine (but it was my decision to collapse ‘Monospace’ and ‘Monospace Typewriter’). If you wondered, the typeface in the diagram is Quercus Sans by František Štorm, released in 2015. What struck me most was the imbalance between text and display typefaces. The typefaces in the categories Display, Script, Geometrics, Comic, Monospace (Typewriter) and the categories I grouped as ‘Miscellaneous’ should not be used for extended text (as in ‘a novel’, rather than ‘slightly longer ad copy’). That’s almost 60 % of the typefaces in the calendar. And let’s not pretend that all typefaces in the Sans Serif category (or, for that matter, the Serif Antiqua or Slab Serif categories) should be used for a novel. Here is why I am disappointed by this distribution: I think that it is more challenging to draw a tolerable text typeface than a tolerable display typeface. It is more challenging because a type designer has more leeway in shaping a letter when the letter is intended for large use in short texts rather than for immersive reading of longer stretches of text. An excellent display typeface may be as hard to pull off as an excellent text typeface, but a mediocre display typeface will still be sort of usable. A text typeface of the same quality won’t be usable, unless you do not mind your readers suffering through an entire novel. Typefaces intended for small sizes and long texts require more subtlety and consistency; even minor deviations can have a major impact on reading comfort. In other words: Designers of text typefaces – and, of course, designers of a small number of well-designed and well-engineered display typefaces – do the heavy lifting in type design. That is why they should be featured at least as frequently as those who take the easier way out. However, it is quite clear to me that there is a larger market for display typefaces, in which fashion and short-lived trends are reflected more strongly than in text typefaces. This year’s advertising may look old when set in last year’s display type, but there’s not much to be said against setting a novel in text type from ten – or some hundred – years ago. That is why there are many more display than text typefaces. And I would be surprised if this general tendency were not reflected in the submissions to the Typodarium. Also, people who buy type calendars probably aren’t the ones who typeset novels on a daily basis. They are rather the ones who produce this year’s ads using this year’s display type. And you cannot call out the editors of the Typodarium on catering to their clientele. What you could call them out on is another case of editorial leniency – this time with respect to the selection of designers and foundries. In an ideal type calendar, each designer would be featured, I think, once or maybe twice and each foundry three or maybe four times, so that you can show the work of as many talented people as possible. That’s quite the contrary of what you find in the 2015 Typodarium. Several designers were featured with five or more typefaces, at least one of them released: Alexander Branczyk (4 × with Raban Ruddigkeit, 3 × with Daniela Costa, 2 × solo), Jordi Embodas, Beate Limbach, Antonio J. Morata, Giuseppe Salerno & Paco González, Sascha Timplan and John Vargas Beltrán. Paul Bokslag, Ronald Studer and Jörg Walter were featured five times, each of them only contributing unreleased typefaces. Most egregiously, an unreleased typeface by Ronald Studer was featured five times – in different weights, but still … You can’t keep people from submitting each weight of their typeface, but these submissions surely must not end up in the calendar. That’s what editors are for. When it comes to the selection of foundries, we see the same lack of variety: Why would you want one foundry – German-based Volcano Type – to be featured 18 times when the second-ranking foundry (FontFont) only contributed eight typefaces? Oh, and 8 of the 18 typefaces from Volcano Type were designed in 2008 or earlier, including two typefaces from 1996 (see above). So, why on earth would you give this one foundry that much space to plug their old stuff? Well, that’s where the story comes full circle. Lars Harmsen, the founder of Volcano Type, happens to be one of the editors of the calendar. Alexander Branczyk, who had a hand in more featured typefaces than any other designer, is a member of the jury. Raban Ruddigkeit, who Branczyk collaborated with on four typefaces, is the second editor of the calendar. I can think of two explanations for why typefaces published and/or (co-)designed by Harmsen, Ruddigkeit and Branczyk are featured more heavily than anyone else’s. One possibility would be that they found their own work – unreleased or old for the greater part – more interesting or significant than more recent typefaces. The desire for self-promotion may have played a minor role in their editorial decision, but I think that another aspect was more important: I couldn’t get rid of the impression that the editors and jury of the 2015 Typodarium just didn’t receive as many good submissions to choose from as you may think. Unable to fill all 365 spots with decent and recent retail typefaces, they seem to have decided to include some of their own work – irrespective of its recency, quality or relevance – as well as a large share of unreleased typefaces (of dubious quality in some cases) to fill the gaps. I am speculating here, admittedly, but I cannot think of any other reason to include these typefaces. In any case, a lack of high-quality submissions would be a valid reason to discontinue the series after 2016. Let me say again that, regardless of the editorial flaws I see in the 2015 Typodarium, the concept of a daily type calendar remains interesting to me. Harmsen and Ruddigkeit are to be applauded for making a foray into this niche and for publishing at least eight consecutive editions of the calendar. I have enjoyed them all, to varying degrees. If anyone continues in this tradition, there are two major aspects that I think need to be improved: First, I noticed that many (type) designers – particularly from outside Germany – who read my review tweets did not even seem to know that the Typodarium existed or what it was. It’s not a good sign if a niche product isn’t even well-known and well-respected in the niche you’d expect submitters and buyers to come from (but the 2016 edition of the Typodarium apparently sold out, so I may be overestimating this problem on the buyers side). This lack of renown may partly be due to the editors of the Typodarium not being very active on social media in 2015: There are no official Typodarium accounts on Twitter or Instagram, just a Facebook page where nothing was posted for the better part of the year. What I have done this year on Twitter – reviewing the typefaces – probably could not have been done by the editors themselves or by the publisher, but an account with background information on each day’s typeface may have sparked some interest from the type community. Second, I think that it is not enough to make a call for entries and hope for quality type to be submitted. The present edition of the Typodarium clearly shows that this won’t happen automatically. There are two ways of dealing with this problem that seem worth trying: The editors could directly approach interesting foundries and designers to encourage them to submit their typefaces. Maybe the editors have already done that, but the designers simply didn’t care for participating in the calendar. In this case, I would suggest adding a weekly ‘editor’s pick’, that is, a new typeface that is sufficiently interesting to be shown, even if its designers were too lazy or uninterested to make a submission. That way, you’d get some more excellent type in the calendar without having to rely entirely on submissions. I am curious to see if some of these problems have been remedied in the 2016 Typodarium or if they will be in 2017. As I am writing this, a wrapped copy of the 2016 edition lies in front of me, even though we are already four days into this new year – four days on each of which I thought at least once ‘Have I written my Typodarium tweet for today?’ before realising: Oh wait, that was last year. Hallo Christopher, danke für deine ausführliche Rezension. Zuallererst; Das Typodarium wird es auch 2017 geben. Aber es wird anders organisiert und gestaltet sein. Denn einige deiner Hinweise haben wir schon aufgegriffen, bevor du sie überhaupt gedacht hast.–) So wird es von nun an keine offene Einreichung geben, siondern wir laden die in unseren Augen relevanten Typodgrafen ein, sich zu beteiligen. Darüberhinaus werden wir uns mehr und mehr den sogenannten Non-Latin-Fonts öffnen, damit der Kalender nicht nur einen Blick auf die kleine alte Welt wirft, sondern auch in den immer größer werdenden Kosmos der Weltsprachen und – Schriften … Du kannst also gespannt sein, wie es weitergeht! Vielen Dank für deine Antwort, Raban. Es freut mich zu hören, dass auch 2017 ein Typodarium erscheinen wird und dass ihr einige der Punkte umsetzen wollt, die mir auch aufgefallen sind. Ich bin in der Tat gespannt auf das Ergebnis. Viel Erfolg mit der Umsetzung! Pingback: Nice italics, bad #Eszett:My tweets about the 2015 Typodarium | Isoglosse.